Two more gifts down! Sorry for the darkness in my pictures. I had to use my iPhone. I have one last big knitting project to finish before Christmas. We’ll see if I can make it in time. Eeeek! 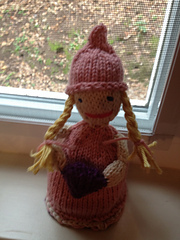 The first finished gift today is a “Sisters” toy from the Itty Bitty Knits book. 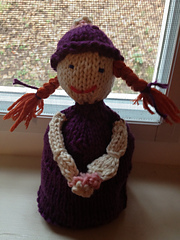 It is a reversible toy with two dolls in it. My 7yo asked for it for Christmas. Here’s a shot so you can see how it reverses. The other project that I finished was a quick man hat for Joe. I really like this pattern. It makes for a great, stretchy, thick hat. I kind of want to steal it for myself.